In jewel sticked case, includes an obi and an extra insert in Japanese. 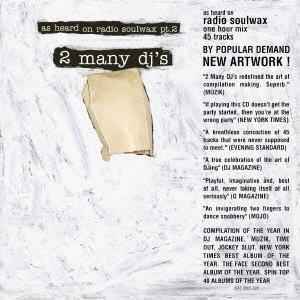 One hour, 45 tracks, by David & Stephen Dewaele from Soulwax. Divided into 31 tracks, -1 being before the first one, you have to step back to hear it. Track 16.1 is incorrectly credited to Interstellar. It's on Copyright (6) - Pogo EP. It was also released as Terranova on the Hitchhiking Nonstop With No Particular Destination album.